Dream home on Gorgeous 4.46-acre Equine property with pond and amazing sunset views. This home has been meticulously updated and improved to include the addition of a Griffin pool with heated spa. The open concept home features modern fresh paint and new wood flooring throughout. There are four bedrooms and three and half baths plus an office. Each bedroom has access to a bathroom. The family chef will enjoy the new gas stove, stainless appliances, ample granite counter tops and tons of storage in the beautiful wood cabinets with detailed trim. The updated master bath with subway tile is the crown jewel of the master retreat. 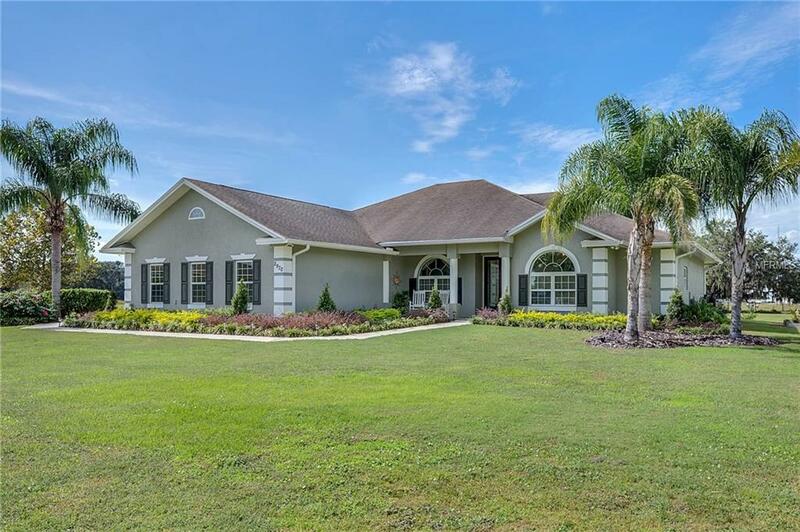 Maximum enjoyment of the Florida lifestyle will be had under the large covered lanai overlooking the pool and pasture where horses roam, cows graze and beautiful birds visit. In addition to the three car garage there is a large parking pad for all your toys, so bring the boats and RVs. The gated community of only eight lots, provides a cozy country feel while still having easy access to shopping, restaurants and entertainment. Theme parks and beaches are easy to visit with the interstate highway less than three miles away. Make your appointment today to see all this home has to offer. Be sure to view the video.